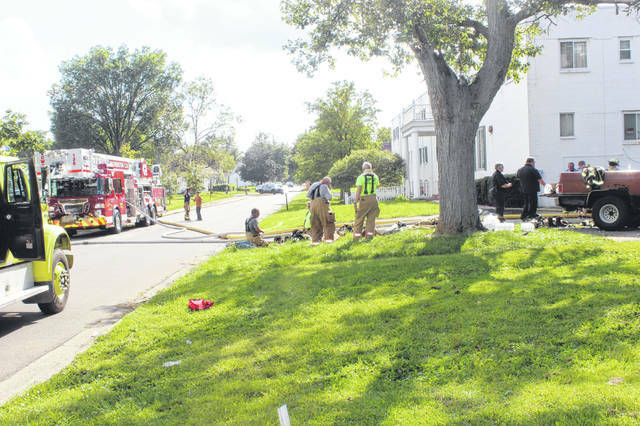 Multiple fire departments mobilized Wednesday afternoon — including the Washington Fire Department and BPM Joint Fire District — on a report of a possible fire in the basement of the old Carlton Manor nursing home on Rawlings Street in Washington Court House. No additional information was available as of press time Wednesday. https://www.recordherald.com/wp-content/uploads/sites/27/2018/08/web1_IMG_6720.jpgMultiple fire departments mobilized Wednesday afternoon — including the Washington Fire Department and BPM Joint Fire District — on a report of a possible fire in the basement of the old Carlton Manor nursing home on Rawlings Street in Washington Court House. No additional information was available as of press time Wednesday.